The National Association of Trade Exchanges is expecting an overflow attendance at this year's annual convention in Las Vegas. Over the years that city has proven to be the biggest draw for their attendees. This year the organization is providing companies attending with a FREE video of the various business sessions. The offer is the first-ever within the commercial barter industry. Other noteworthy events will include the "roasting" of outgoing NATE Executive Director Tom McDowell (one of the founders) and the introduction of his replacement, Alan Zimmelman. The beautiful Monte Carlo hotel and casino will be the site of the convention. For further details contact Alan Zimmelman at (760) 944-7399, or fax (760) 944-7998. Contrary to what's reported in the business press, most corporate mergers (numerically speaking) in the U.S. are quite small...involving deals valued between $500,000 and $2 million. Under a new tax law, as of December 17, some business owners will be paying taxes on money they may not have received. In short, the new law requires that taxes on the proceeds from the sale of a business must be paid all at once, even if the funds are to be received in installments over several years. It's estimated 260,000 businesses a year will be affected, as most firms with less than $50 million in annual revenues rely on an installment arrangement. The obvious way to avoid the new law is to arrange a stock sale, rather than making an asset sale. The trading of one's stock for another company's equity is now used in 59 percent of the mergers and acquisitions taking place annually in the U.S. Although many believe that Congress didn't realize the tax rule would so broadly affect small business, it is expected to be a good revenue generator, bringing in approximately $1.9 billion over five years. A coalition of 42 groups, including the National Federation of Independent Business and the U.S. Chamber of Commerce, recently wrote Treasury Secretary Lawrence Summers urging him to support efforts to repeal the "onerous" provision. Similar letters were sent to the Senate Finance Committee and House Ways and Means Committee. If lobbyists don't succeed in reversing the rule, Wall Street may create an alternative, a securitized note, enabling the seller to receive all cash up-front to cover taxes, while the buyer would pay some of the purchase price in cash installments. These payments would be received by the buyers of the securitized paper. Top talent firm Endeavor Agency, home of "Titanic" director James Cameron and "Ally McBeal" creator David E. Kelley, announced an exclusive agreement to create internet-only programming with the Orange County (CA) new-media company Broadband Interactive Group. Broadband Interactive Group, BIG for short, is backed by Henry Samueli and Henry T. Nicholas III, founders of computer chip maker Broadcom Corp. BIG already merges television with the internet, creating programs and webcasts on extreme sports that target young viewers. The two companies will form an editorial board to oversee the venture, seeking help from some of Hollywood's creative heavyweights for a medium that could transform traditional filmmaking. In exchange for access to its talent base, Endeavor will get an undisclosed amount of equity in the technology company. When vendors call on your company intent on making a sale...bringing you in as a new client/customer...you have the perfect opportunity to form a trading relationship, wherein you will use yor products or services as a form of payment. Tell them how you will buy from them, and the advantages to them. Explain that they will gain a long-standing customer by doing business with you in this reciprocal purchasing manner. Ask, specifically, for what you want or expect from them. Reinforce that the method of payment will be in the form of goods/services, not in cash. Restate the benefits of what you are proposing, and then take the first step to close the arrangement. Continue to practice and refine your presentation. As you improve, you will be amazed at how often people will give you exactly what you ask for. But remember, don't give up after one or a few attempts...realize that success is assured by persevering. As hockey sensation and hall-of-famer Wayne Gretzky said, "You miss 100% of the shots you never take!" So take your shots, ask every vendor to participate with you in the barter arena. For hundreds of techniques and barter strategies like this, you will want to look into acquiring the only barter course of its kind, the BarterNews FastStart Program...see our "Home Page" for further details. George Samenuk, 44, head of IBM's sales and distribution activities for the Americas (he rang up $40 billion in sales), is leaving to become chief executive of TradeOut.com, an online exchange for surplus business equipment, which is only a year old. In November the company secured $22 million in funding from eBay along with Benchmark Capital and Morgan Stanley Dean Witter. Samenuk is taking over a business with 160 employees, but says he can build TradeOut to 1,000 or more employees, and billions of dollars in revenue. He's also immediately preparing for an initial public offering. BarterNews publisher Bob Meyer is now attending the International Reciprocal Trade Association's Australian 2000 Conference, held at the luxurious 5-Star Kooralbyn Hotel Resort in the beautiful countryside of SE Queensland. Meyer is scheduled to speak February 24, for 90 minutes, on the future of the commercial barter industry in the new economy. The four-day event has attracted attendees from around the world and will equal in attendance, IRTA's Annual Convention. 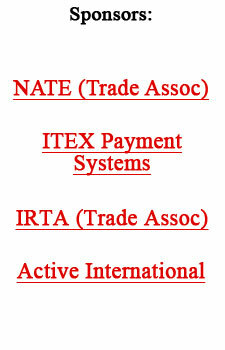 Quite an accomplishment for IRTA-Australasia. Movie studios are bartering with major publications. In exchange for fresh images (cover photos) for the magazine and entertainment-industry news, the studios obtain valuable editorial coverage. All of which equates to more sales as people learn about the latest movies! ShopNow.com, which purchased Ubarter.com in December, has announced a strategic relationship with TRADEX Technologies, provider of the platform that powers the world's leading business-to-business marketplaces. ShopNow intends to integrate the TRADEX platform on ShopNow's web site, www.b2bNow.com, to enable the businesses using this portal to simplify their procurement and trading processes. The site boasts over half a million businesses in 62 categories, with access to over 175 international markets. Desirable advertising time slots are tougher than raising money nowadays...that's the message from the leading ad agencies to the dot.com companies. Which means one thing: The ad payments are no longer requested to be in cash, but in a company's stock! The bottomline is that ad agencies, tired of watching the images they create turn their clients into overnight millionaires, have joined the long list of other service providers (publicists, accountants, attorneys, real estate agents, and even contractors) and are demanding a piece of the pie.